This entertaining work analyzes the strengths and weaknesses of the Civil War’s top Union and Confederate generals using extensive primary documents and original research. Included are the surprising answers to intriguing questions: How did Union general Ulysses S. Grant attain such a high rank after numerous failures in civilian life? What made the dour, almost fanatically religious Stonewall Jackson perhaps the best combat leader in the Confederacy? History professor Richard M. Walsh explains why Ambrose Burnside was demoted, who gave George McClellan the nickname “Little Napoleon,” and why men of both sides respected Robert E. Lee. Walsh even includes outstanding citizen soldiers who quickly advanced in rank on both sides in his remarkable chronicle. 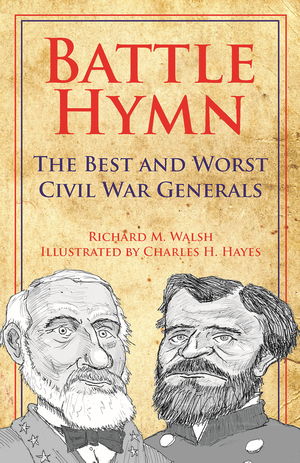 Fascinating facts are gathered in chapters that group the generals from the worst to the not so bad to the best, all punctuated by satirical portraits drawn by Charles H. Hayes. Walsh’s record is a must read for history buffs from both sides of the Mason-Dixon! An adjunct professor specializing in American and European history, Richard M. Walsh teaches courses on the American Revolution, Civil War, Native American-US government relations, imperialism, and the history and culture of Ireland. He received bachelor of arts degrees in economics and history from Siena College and a master of science in education and history from Long Island University. A prolific author, father of four, and grandfather of two, he lives with his wife and two large Newfoundland dogs in Northport, New York. Charles H. Hayes is an author, editorial cartoonist, and award-winning artist. He opened an art gallery after his retirement, becoming an accomplished sculptor, and his political cartoons are published in several newspapers. 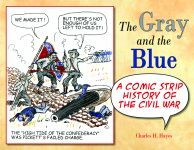 Hayes is the author of Civil War Limericks and the author and illustrator of The Gray and the Blue: A Comic Strip History of the Civil War. Both are available from Pelican. He lives in Tyler, Texas. Click here for Chapter 1. Click here for index.